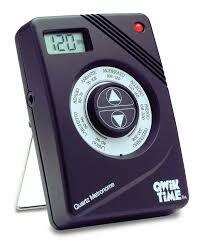 A clicking device that sets the tempoThe speed at which the music is or should be played. for a rhythmThe systematic arrangement of musical sounds, which creates a flowing and/or syncopated pulse. ... or song. It measures time in BPM (beats per minute).